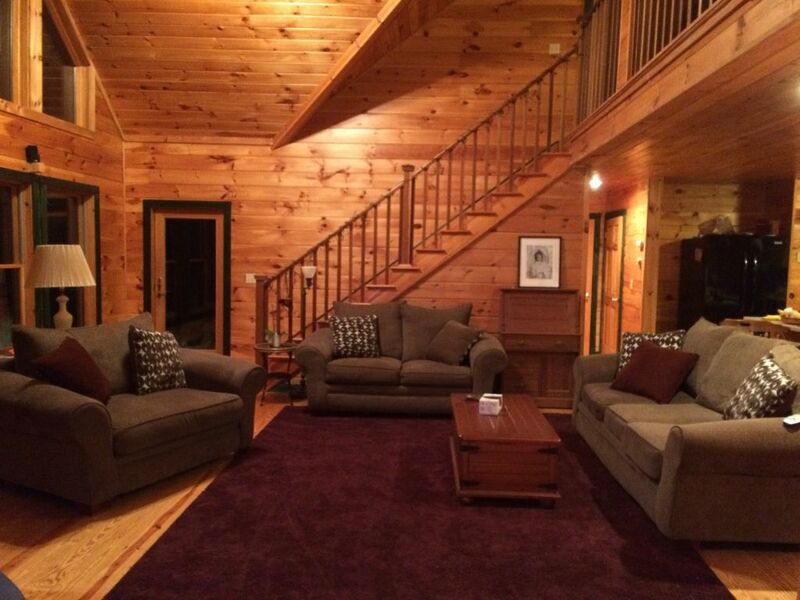 Located directly on the waters edge of the Great Sacandaga Lake, gateway to the Adirondacks. A true four seasons destination with all the comforts of home. Less than an hour drive to Saratoga Springs, numerous cultural and historic locations in and around the New York Capital District Region. Hiking, biking, skiing, swimming, canoeing, kayaking boating, fishing, state parks, all within minutes from this distinctive Adirondack retreat. I am a retired teacher and my husband works for a municipality. We LOVE coming home to the lake. We moved here permanently in 2011. For us, this property represents memories, family bonding, fun, relaxation and peace by the water. Memories of summers spent in Sacandaga Park, helping with the family business and fishing, boating and swimming on Sacandaga Lake were the strongest draws. Spending time with our family and friends, creating more lasting memories here is reason enough to stay. The house is perfect for entertaining family and friends with plenty of space inside and out. The dining room seats 10 adults comfortably. The wrap around porch with an outdoor kitchen is great for relaxing and the large deck with picnic tables faces the lake. The picnic area directly on the lake has a picnic table a horse shoe pit and fire pit. If you are a morning person, coffee on the dock, watching the sunrise and listening to the loons is the best! The property is private and peaceful. Property is situated directly on the Great Sacandaga Lake with 120 feet of lake frontage, private dock and boat mooring, picnic area and fire pit. Sacandaga Park Golf Course is a 5 minute drive from the house. 2 Golf club sets available upon request. The open floor plan facilitates maneuverability. There is a bedroom on the first floor with a bathroom directly across the hall. Please contact us for any other information. This home is available on a weekly basis for the months of June, July and August. Management is on site on a separate parcel of the property to assist with any needs during your stay. Property was in perfect, clean condition and Dorothy and Russ, the owners, were absolutely great. Dorothy and Russ really know how to make your stay in their beautiful home enjoyable. They never hesitate to help in any way they can. The home is spacious, comfortable and well equipped from the kitchen, to linens, towels, indoor and outdoor seating, etc. Everything was clean and well cared for. The Italian restaurant down the road has outdoor seating and delicious food too. If you bring a boat, be sure you are ready to moor it. This was our first experience with mooring, and it can be tricky, especially if windy, although it did provide us with a lot of laughs!! We wouldn't hesitate to recommend this vacation home. It was an awesome week. We stayed for a week in August 2018. Check-in was seamless and we were greeted by the owner upon our arrival who lives on the same property right next door to the house. Owner was very kind and helpful. House was really nice and clean. Had all the items you need in the kitchen. Many board games provided in the living room. Bedrooms were all nice size but all of them have one bed (double bed I believe). Would be nice if at least two of the of the rooms had bunk beds or two beds as many times people/brothers/sisters don't like to share a bed. BBQ grill was in a perfect location on the enclosed deck (for rainy days). Backyard and lakefront was awesome. Easy, pleasant walk to the lake through a shaded area full of trees, perfect!. Horseshoes are present and we enjoyed some family competition. kayaks and canoes were provided, but we opted to rent a pontoon boat instead. The Lake and mountain views were amazing ! Fishing was very good on certain days; late evening provided the most fish. During mid week of our stay, loud construction/demolition (9am-4pm) was ongoing next door. Also on the other side of the house there were loud renters which kept us awake until about 1am for a couple of nights. We could hear entire conversations like they were next to us. We realize the owner has no control over this, but we feel we should point this out. As the house has no air conditioning units to drown out the sound, due to warm weather we were forced to keep windows open to cool down. One thing we weren't thrilled about is waking up early to wash and dry all the bedding and towels. Check out is at 11am, so all sheets, pillow cases, towels had to be washed, dried and folded before then. We started washing them at 8am and everything was done by 10:45am. Not fun on the last day, but not the worst thing. Most rentals we go to, the cleaning staff washes and dries these items on the day of check out. Overall the house and property was wonderful and treated us right. Tons of fun on the lake and the property grounds. Would recommend this rental for any family looking for a nice and clean lakefront rental. We absolutely love this home. This was our second stay here and we loved everything about it. Everything you need is at your fingertips. We took our boat and spent every day on the lake which is amazing. The home is spacious and well kept! Had a wonderful holiday week on the lake! Owners Dorothy and Russ were great! We rented this house during the first week in July 2018. Our family enjoyed this beautiful adirondack home on the lake. The house was equipped and furnished with everything needed. There was plenty of gathering space for eating and game nights. Although we had a problem with the refrigerator, the owners were very responsive and worked to solve the problem quickly. Highly recommend this rental property. Had a great time! Property was awesome! Located in the foothills of the Adirondack Mountains, between Mayfield and Northville, on the Great Sacandaga Lake. Northville-Placid trail is a 5 minute drive for hikers. The summer months are packed with musical, art and cultural events taking place in the village.Take advantage of the proximity to the Saratoga Springs and the Saratoga Racecourse, Saratoga Performing Arts Center featuring the New York City Ballet, the Philadelphia Orchestra, the Newport Jazz Festival as well as other big name concerts and other events. Saratoga Raceway and Casino and the new Rivers Casino are a 45 minute drive from the house. For antique lovers, a jaunt around the lake to the village of Ballston Spa is the place to go for a morning or afternoon with shops and amazing restaurants lining the streets. Relaxing on the lake, canoeing, swimming or sunning on the dock are always your instant options during your stay here.